Yamaha launched the new MT-09 performance streetbike at the 2016 Auto Expo today. The new motorcycle has been priced at Rs 10.2 lakh ex-showroom Delhi. The nearest rivals for the Yamaha MT-09 are the Triumph Street Triple (locally assembled) and the Kawasaki Z800 (CBU from Thailand) which have been priced very competitively in the Indian market. 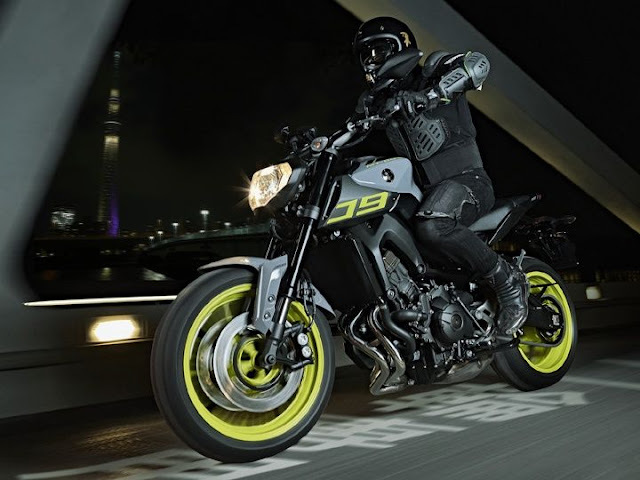 The Yamaha MT-09 is a street oriented performance bike and adopts styling similar to the MT-07 with a petite headlamp and a chiselled fuel tank with minimum use of body panels. Special attention has been given to make the riding posture comfortable and upright with a wide handle bar and mildly rear-set footpegs. The motorcycle employs a die cast aluminium diamond type frame and swingarm to keep weight low while providing apt amount of stiffness. The Yamaha MT-09 is powered by an 850cc, triple-cylinder, liquid-cooled motor producing 115PS at 10,000rpm and 87.5Nm at 8,500rpm. The powerplant is mated to a 6-speed transmission. It also sports a traction control system with two different riding modes while ABS is optional. The bike employs a USD front forks and monoshock unit at the back while braking is done by disc brakes.